I wanted to shake things up a little bit in terms of my creative output. Staying true to my interpretive class thesis (portraits), I decided to do a social commentary. 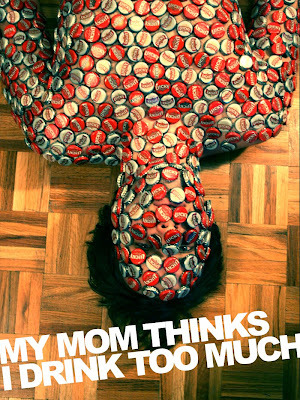 To make a long story short, I told my friends one time that my Mom (who I dearly love) told me that I drink too much. Finding this comical we all had a laugh and moved on. Or so I thought. Now whenever I crack a beer one of my friends speaks up, "Greg I think you drink too much." I really had no reason to do this until I found a copious amount of bottle caps at my friends apartment. The process took so long to separate, organize, stuff and stick the caps on. I think it was worth it. It's something different. And it was fun! I need to make my projects more fun or I'm slowly going to wither away into a recluse artist who paints nothing but landscapes and dog portraits. This is just the first piece of the series. I will display more of this venture soon. You're a walking Lucky ad lol. Sell it to them (that was the capitalist in me).